Beams and the G3TXQ Broadband Hex Wire Beam in the past seven years. Click here to see a Google map of where HexKit baseplates are being used. 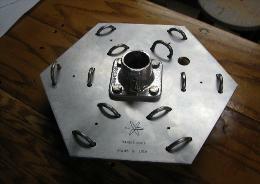 The baseplate hub assembly uses proven components. Note: At the present we have suspended manufacturing due to an extended illness in the family. The online store will be offline until we are able to fulfill orders.